Wetaskiwin once again hosted a remarkable week of music, voice, bands and theatre during their 36th music festival, culminating with a Friday night concert and awards ceremony. Throughout the week, young artists performed their selected pieces before their peers, family, guests and importantly, the adjudicators who carefully studied the student’s technique, poise and positioning. They then offered their critique and advice drawn from years of study, practice and instruction. The expert instruction helps the growth of the student, potentially awarding scholarships and preparing them for their music exams which determine advancement. Many of those who excelled and stood out among their peers were featured on the agenda of the final evening concert. On the Friday night, Wetaskiwin’s United Church was filled with friends, family and guests who witnessed what has long become an evening of excellence, looked forward to by many as one of Wetaskiwin’s premier annual events. With twenty-six performances on the schedule, it was pleasant to see how well planned the evening was, as well as MC Scot Lorenson expertly keeping things flowing along nicely. Not enough can be said about Alayna Chrunik. She is a prime example of a young talent on the rise. Alayna clearly loves to perform. She has significant acting, theatrical and vocal skills already despite her young age. What draws you in immediately is her raw ability to convey the story through her energy and facial expressions. Alayna was just one of the many that shone that evening. 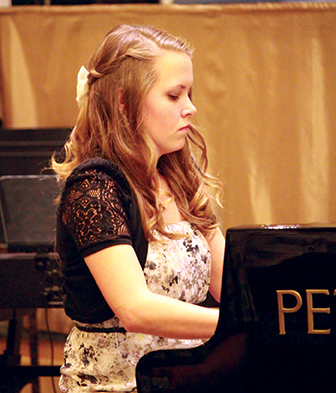 Hannah Anderson is a veteran of the Music Festival, with her name engraved on many of the top awards over the years, and was this year’s winner of the Overall Senior Piano and the Rose Bowl recipient. Hannah is able to communicate the passion of the composer, as well as herself through her instrument. Ashley Reiter and Michaela Strydom surprised the crowd with Michaela delivering a red rose mid-performance to President Teresa Kirwan during their piano duet, and Jenna Sonnenberg, Julianna Reiter and Megan Strydom entertained with a piano trio that rotated positions and included kazoos. These only give a glimpse of the host of young talent our region has to offer. If you were unable to make it out this year, it is worth the effort to put it into next year’s calendar already. Congratulations to Bev Sweet (Executive Director), Teresa Kirwan (President) and their army of volunteers.